What: We are calling for people to organise actions and events in their region. IWOC London will also be organising a demo, with details to be announced. We encourage groups to not only raise awareness about Kevan but to highlight solitary confinement in their own countries and amplify the voices of those behind bars. It is Kevan’s birthday on the 9th March and we encourage people to also write letters and birthday cards! Why: Kevan Thakrar has been fighting for his life for the last 11 years after a wrongful conviction . In 2008 at the aged of 20 Kevan began serving a life sentence, with a minimum term of 35 years, under the highly controversial “joint enterprise” doctrine . Kevan’s refusal to submit to racist abuse from prison guards has made him a target for reprisals. Notably, in 2010 he suffered a premeditated attack in his cell by HMP Frankland guards. When he fought back he was charged with attempted murder and GBH, and put in solitary confinement, where in one form or another he remains to this day. The charges were sufficiently brazen that a jury cleared him unanimously in a rare victory against the testimony of prison offices. Despite his success in court, Kevan has been isolated in Closed Supervision Centres (a ‘prison within a prison’) across the country and currently at HMP Whitemoor. 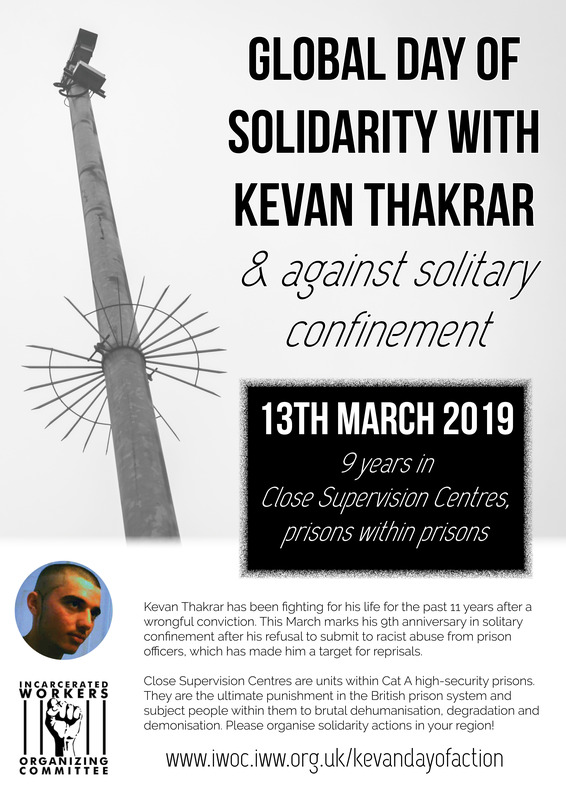 Closed Supervisions Centres are the most extreme form of imprisonment in the UK, modeled on the “supermax” prisons in the United States, and Kevan’s testimony is one of the few sources of information available to those on the outside. They are the ultimate punishment in the British prison system and subject people within them to brutal dehumanisation, degradation and demonisation. Kevan Thakrar is a key voice from inside the UK prison today, writing extensively on the conditions endured by people held in the worst prisons in the country. Read his recently published letter that he sent to the Justice Secretary that details the perpetual injustice of his case. You can also read two historical zines published about the CSC written by Kevan distributed by Bristol Anarchist Black Cross . Kevan continues to suffer both PTSD and further reprisals for shining a light on the abuse suffered by himself and by other incarcerated people, but still refuses to stay silent about the abuses of the prisons system in general and the Closed Supervision System in particular. 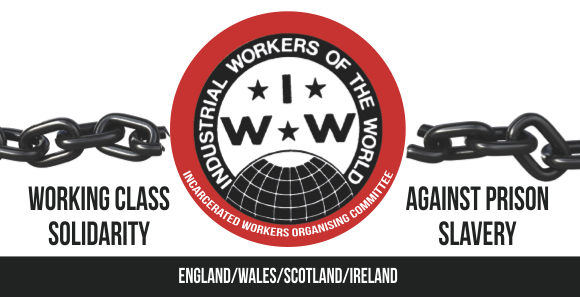 If you would like more information about Kevan or would value support from IWOC to help organise an event/talk/info night please contact us at iwoc@iww.org.uk. We have friends, family and comrades of Kevan who are keen to help share his story, as well as an ex-prisoner who was in the CSC who passionately wants to expose the system. Wednesday 13th March 2019 marks the 9th year anniversary since I was first isolated from mainstream prison population and detained within the notorious Close Supervision Centre (CSC) system under Prison Rule 46. The majority of this time has been spent in conditions which can accurately be described as Solitary Confinement, but thanks to the support and pressure of those outside, for the last few months I have been in small group isolation instead, mixing with five other guys. It is well known that serious harm is caused by detaining a human being even within the slightly improved environment I currently find myself in, for the shortest period of time. Reports have been published condemning this kind of treatment as long ago as 1997 by Amnesty International, and the prison service even have their own report saying the same things authored by their Chief Medical Officer, Sir Donald Acheson. It is for these reasons that the prison service lie about the conditions. They force me to suffer, officially they do not subject anyone to Solitary Confinement in this country. They claim that I was sent here to HMP Whitemoor’s CSC to enable me to access an “improved regime” and “psychological risk reduction” so that I can progress out of CSC. The problem is that to date they have never identified any so-called risks to reduce because of the fact that I have been wrongfully selected to the CSC based upon false allegations made by corrupt and racist prison officers at HMP Franklin, which I was subsequently proven innocent of at Newcastle Crown Court December 2011. The focus of psychologists then has been to coerce, manipulate and pressure me into going to the High Secure Hospital Broadmoor so that the prison system no longer has to deal with the problem that they have created. Why should I go to a Mental Health Hospital to alleviate the pressure on prison service management to get me out of the CSC, rather than fight to be returned to mainstream prison population like I have been doing for the last 9 years? So, what is needed instead is an increase in the pressure to progress me which to start with could begin with a protest demonstration to mark the anniversary. I therefore call for the support of everyone willing and able to help me to overcome this challenge by publicising, then turning up for the demo, which will be announced by IWOC, as well as organising actions at embassies and other places where you are. Thank you all in advance for your support, and I look forward to soon being able to tell you the positive results of your action.